Equipped kitchen, 2 bedrooms, 2 bathrooms, living room with fireplace, garden. 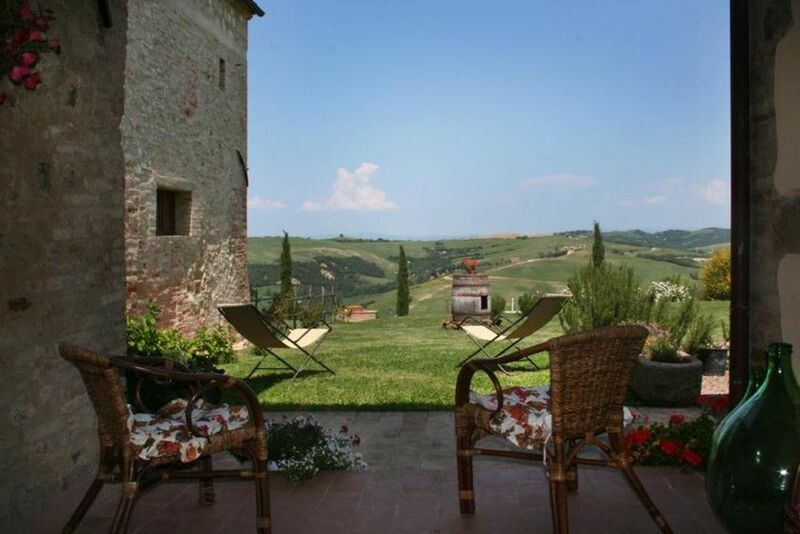 Casa di Maria is in the beautiful countryside of the Val d'Orcia near Montalcino and Siena. Overlooking large green areas, olive trees and vineyards, with private garden table and chairs, barbecue. The Tuscan-style apartment accommodates four people has a large dining area with kitchen,refrigerator, coffee maker,kitchen pantry,sitting room with fireplace, sofa, one bedroom with twin beds and ensuite bathroom and one with double bed and bathroom in front of the bedroom.In the nearby we have the spa, horseback riding, swimming pool and wine cellars wine Brunello. Just 15-20 minutes you can reach the famous places: Montalcino, Pienza, Montepulciano, Bagno Vignoni. Upon arrival our guests will find what you need to prepare a lunch, a dinner, a breakfast and a bottle of wine we produce. Cooking classes can be booked with a mother tongue teacher at her school . Also you can book food and wine tours, truffle research in the farms near Casa di Maria. You can book cooking lessons with a teacher at his school and also tastings of wine, cheese, and even truffle hunting at local farms. A thoroughly enjoyable and relaxing holiday for all the family. The property was fairly remotely located a couple of miles along an unmade road from the nearest village which had good facilities including a small supermarket and a couple of cafes/bars. Access from here to the surrounding countryside and hilltop villages and towns was good with Sienna the major settlement being about 40 minutes drive and well worth spending the day exploring and discovering the local cuisines.The views from the villa were as spectacular as the advertised photos with a lovely private garden and shaded outdoor dining area where we enjoyed our meals looking across the wonderful Tuscan landscape. The living area and bedrooms were very clean and spacious with adequate facilities. We had a lovely welcome from Angela and Alexandro once we arrived and were sad to leave as the week went quickly. An ideal location for 'chilling out' or driving around the Tuscan countryside. Casa di Maria is a stunning property with extraordinary views. We'd stay again in a second. Our stay at Casa di Maria was wonderful. Angela and her family did everything they could to make us comfortable. We had amazing sunset views every night, and we loved the quiet and slower pace after being in the city. We had a significant amount of space and everything we needed to cook and have long relaxing meals outside. The location is also close to everywhere you might want to go in Tuscany. I can not emphasize enough that the pictures do NOT do this this place justice. It is a dream. We hope to return! Nice house, friendly owners, infested with bugs. Very sad to report that the 2wks we booked at Casa Maria ruined our time in Tuscany. We ended up spending 5 nights in hotels. Tried to get the owners to treat the house for the bug infestation but they said nothing they could do. We asked to leave and get reimbursed and they refused. I will post a more detailed review of all our complaints as well as pictures in _____soon. Also, when we reported to VRBO the above complaints they could do nothing but forward our complaint to the owners. We have traveled all over Italy and other European countries and NEVER had a problem like this before. These people do not have the slightest idea of ​​the Tuscan countryside: they have booked a country house but wanted it in the city !, for little bugs, which in the countryside is normal, have created problems as if they were lions! For so many years I have done this job I NEVER had problems !!! I'm sorry but this is not correct !!!! Beautiful location, great property, wonderful owners and a perfect vacation in Tuscany! My wife and I stayed here for 4 nights, we wish we had stayed longer. The owners of the property (Angela, and Adele) greeted us at the property and were so friendly, you can tell they really care about making everything as perfect as possible for their guests. The home-made fruit pie upon arrival was a really nice touch! They are great people. The 360 degree views from this property are breathtaking. We made sure to get back early every night to watch the sunset from the yard with a glass of wine. This was our second trip to Tuscany and I really don't think you can find accommodations with better views and overall setting. The interior of the property is very spacious and has everything you will need. Location is perfect for touring the Montalcino and Montepulciano wine regions. Also not that far from Siena. Thanks for the beautiful words, I look forward to another holiday! This place is a Wonder!! We stayed here for a week. Montechiari is very close to the most charming Tuscan villages, towns and all these fantastic views of Tuscany that became pilgrimage sites of photographers from all over the world. But not only, the location itsel is the real heart of Tuscany, and all this beauty 360 degrees around was just for us, right now and here. Fabulous house, fresh air, green hills, the silence sounds like a melody. Sunrises and sunsets. BBQ and wine. And of course dear owners that became our good friends, our Tuscan cousins. More briefly: if we could we would stay here forever! Angela, Alessandro, Andrea, Adele .. and ehhhh .. Vilma! Grazie di cuore, ci mancate tanto tanto. A presto! Thanks for the nice words. You are special people! Angela, Alessandro, Andrea , Adele e Wilma! Visit the wineries production of Brunello wine in Montalcino, tasting dishes with truffles in San Giovanni d'Asso, production of pecorino cheese in Pienza, Montepulciano visit to the cellars of wine production Nobile.